With 26 percent of the Missouri corn crop planted, farmers are right on target, said University of Missouri Extension specialists Bill Wiebold and Brent Myers of the College of Agriculture, Food and Natural Resources. Missouri corn producers have planted more than double the amount of corn as they had planted last year at this time, according to the U.S. Department of Agriculture’s April 21 crop progress report. Large, efficient machinery means farmers can plant a lot of corn in a short amount of time, Wiebold said, and soil conditions can change quickly. “We can plant our corn crop in about two weeks with good weather in this state,” Wiebold said at the weekly MU Plant Sciences teleconference. Southwestern Missouri leads the state in corn planting, with 77 percent of its acres already planted and 31 percent of the crop emerged. The northwestern and northeastern parts of the state, as well as east-central Missouri, lag the rest of the state. Myers warns against fieldwork when fields are not ready to till. Soil conditions rather than the calendar dictate when it’s right to work the ground. Late harvest in 2013 caused tillage delays in parts of the state, but there is plenty of time left. Avoid early planting on poorly drained soils or those that pond, Wiebold said. “Mudding” seeds into wet soil causes irreversible damage to the plant’s root system and results in lower yields. 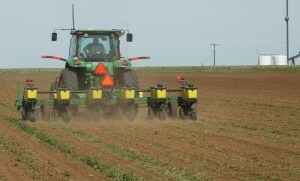 Additionally, equipment can cause compaction of the soil. Previous: Biologicals Q and A – What is the research showing us about the effectiveness of Biologicals?